President Donald Trump embarks on a five-country tour of Asia this week with plans to address North Korea’s nuclear program, economic relations and other issues important to the region and the United States. Over 12 days, Trump will travel to Japan, South Korea, China, Vietnam and the Philippines. While majorities in the region hold favorable views of the U.S., most disapprove of several of Trump’s signature policies, according to a Pew Research Center survey conducted in the spring. 1 Asian nations are divided when it comes to having confidence in Trump. Globally, a median of just 22% say they are confident Trump will do the right thing when it comes to international affairs. But of all 37 countries the Center surveyed, Trump’s greatest support comes from the Philippines, where 69% say they have confidence in him. A majority of people in Vietnam (58%) also express confidence in Trump. The shares are much smaller in Japan (24%) and South Korea (17%). In these two countries, confidence in the U.S. president is down dramatically from the end of the Obama administration. South Korea, for example, has seen a 71-percentage-point drop in confidence in the U.S. president since 2015. 2Several Asian countries have greater confidence in Trump than in Chinese President Xi Jinping. 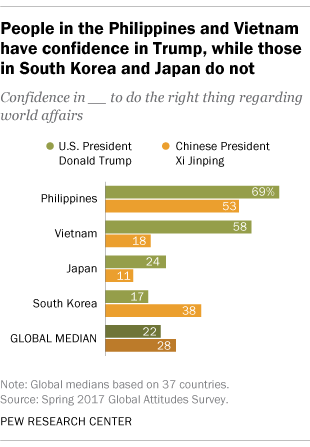 While Trump faces low global confidence overall, greater shares of people in the Philippines, Vietnam and Japan are confident in Trump than in China’s leader. (Within the region, Filipinos had the highest confidence in Xi, at 53%, while the Japanese had the lowest at 11%.) In contrast, people in South Korea were more than twice as likely to have confidence in Xi than Trump regarding world affairs (38% versus 17%). 3Many in Asia see the U.S. as the world’s leading economic power. Although many European publics view China as the world’s leading economic power, majorities in South Korea (66%) and Japan (62%) say the distinction belongs to the U.S. Around half of those in Vietnam (51%) and the Philippines (49%) also say this of the U.S., similar to the share of Americans (51%) who hold this view. Among the four Asian countries, the shares who say China is the world’s biggest economic power ranges from 17% in Vietnam to 27% in South Korea. 4 Most oppose Trump policies that withdraw U.S. support for major trade and climate change agreements. Globally, a median of 72% disapprove of Trump’s proposal to withdraw the U.S. from major international trade pacts. Majorities in Japan (66%) and Vietnam (61%) hold this view, as do 72% in the Philippines and 80% in South Korea. The survey was conducted after Trump signed an executive order withdrawing the U.S. from the Trans-Pacific Partnership free trade agreement, of which Vietnam and Japan are signatories. 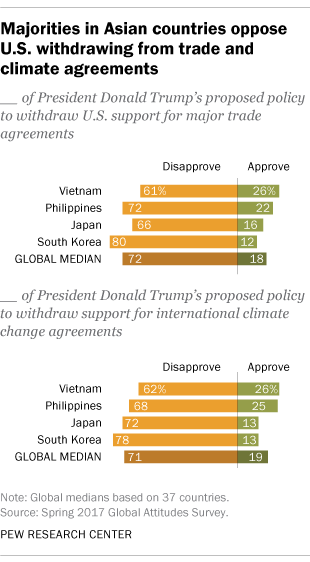 Majorities in the four Asian countries also disapprove of Trump’s proposed policy to withdraw support for international climate change agreements. 5Majorities in Asian countries are concerned about North Korea’s nuclear program. Concern is highest among Pyongyang’s closest neighbors – South Korea, Japan and the Philippines, where 85% or more in all three countries say they are at least somewhat concerned. Anxiety is greatest in Japan, where 66% say they are very concerned about North Korea having nuclear weapons. Within the Asia-Pacific region, people in Vietnam are least worried about North Korea’s nuclear program – only around a quarter (23%) say they are very concerned. Attitudes diverge on how to best deal with North Korea’s weapons program. A majority in Japan (61%) prefers increasing economic sanctions, as do around half of South Koreans (51%). Those in Vietnam and the Philippines, on the other hand, lean toward deepening ties with North Korea (43% and 45%, respectively). 6 People in the region are split on how relations will change between the U.S. and their country. Many countries around the world do not expect relations between their country and the U.S. to change over the next few years with Trump as president. Globally, a median of 41% expect relations to stay about the same and 32% expect relations to get worse. Within the Asia-Pacific region, countries are split. About as many in South Korea say relations will stay about the same (45%) as say they expect relations to sour (43%). Around a third (34%) in Japan say relations will stay about the same, compared with four-in-ten (41%) who expect relations will get worse and 17% who say relations with the U.S. will get better. 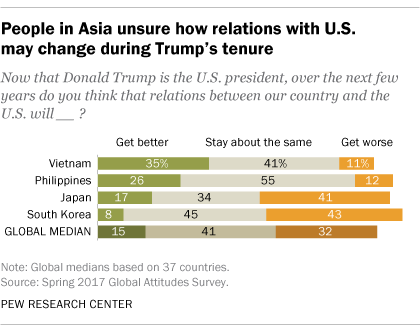 In the Philippines and Vietnam, people are more likely to say relations with the U.S. will stay the same or improve now that Trump is president.